Tibet is more beautiful and magnificent than you could ever imagine with an area of more than 2.3 million square kilometers. From the Kham region in the east to Ngari in the far west, you will find vast contrasts - from evergreen forests intersected by narrow, the steep canyons to the barren and desolate landscapes of the western region. There is hardly a blade of grass. And from the majestic Himalayas in the south to the pastoral areas of the north, you can experience the perennial snow-capped mountains and the traditional and authentic Tibetan nomadic lifestyle. You will immediately be entranced with whatever you discover from the mystery and exquisite beauty of Tibet land. Based on the diverse terrain we live in, the colorful traditions we follow and the rich experiences we offer, we can provide you with a selection of meticulously designed itineraries that meet your interest and budget for your Tibet Tours. From a wide range of tours, there is definitely one we can arrange for you. Highlights: No visiting today, better take rest in the hotel. Arrive at Lhasa train station or airport, your guide and driver will pick you up there in person with a warm Tibetan style welcome ceremony by presenting you Khata and transfer you to the hotel afterward. You are suggested to stay at the hotel to have good rest for better acclimatization. In the morning, visit Lhasa's landmark-Potala Palace, in which myriad chapels, audience halls, Buddhist frescoes, Thangkas, combinations of Mandela, figures of the Buddha stored. Then in the afternoon, visit the Jokhang Temple which was built by Princess Wencheng of the Tang dynasty during Songtsen Gonpo's period in 647. It’s well-known as the center of Tibetan Buddhism. After the Johkang Temple, we will start a circular pilgrim route along Barkhor Street where you can purchase traditional Tibetan and Nepalese artifacts, religious implements, antiques, books, music instrument, Thangkas, and etc. In the morning, drive to Drepung monastery where was used to be as the government center in Tibet until the fifth Dalai Lama moved to the famous Potala Palace. 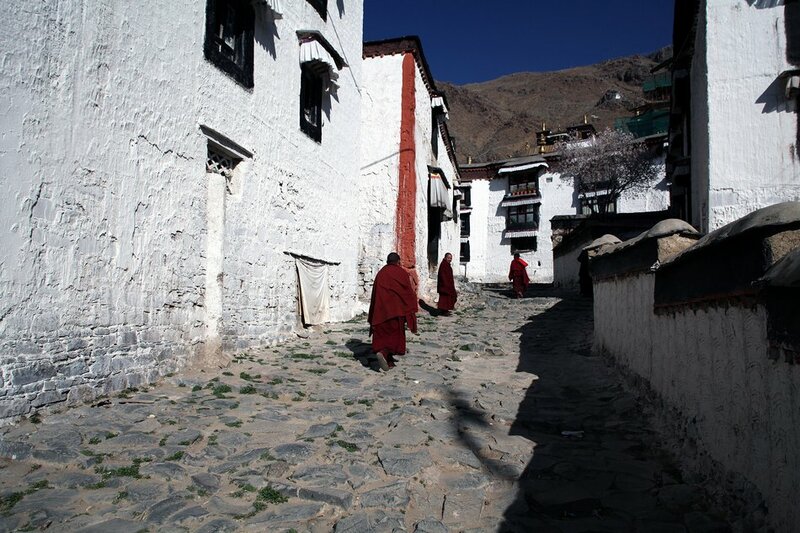 It is the biggest Buddhism College in Tibet Iand once home to more than 10000 monks. In the afternoon, drive to visit Sera monastery to enjoy the sight of monk scripture debate session that will start at every afternoon except Sunday. In the morning you'll start the drive to Shigatse, via Gyantse on the Southern Friendship Highway. You'll see the tranquil turquoise waters of Lake Yamdrok at your feet when you Cross over the summit of Kamba La (4794 m). It’s one of the three holiest lakes in Tibet. Far in the distance, you'll spot the towering massif Mt. Nojin Kangtsang (7191 m), and the stunning Karo-la Glacier (5045 m). After arriving in Gyantse, you can choose to either stroll around town, explore Gyantse Dzong which is the legendary battle site of the British invasion of Tibet or visit the Pelkor Tsode Monastery. Afterwards, you'll drive to Shigatse, and overnight there. In the morning, we will visit the Panchen Lamas- seat-Tashilhumpo Monastery which was built in 1447 by the first Dalai Lama in Tibet. In the monastery placed a giant statue of the Maitreya Buddha and is 26.2 meters (86 feet) in height. The relationship and stories between Dalai Lama and Panchen Lama are always interesting and tantalizing, a visit to it, you will grasp it all. Later in the afternoon, we will drive back to Lhasa. Our guide and driver will transfer you to train station or airport, tour ends.